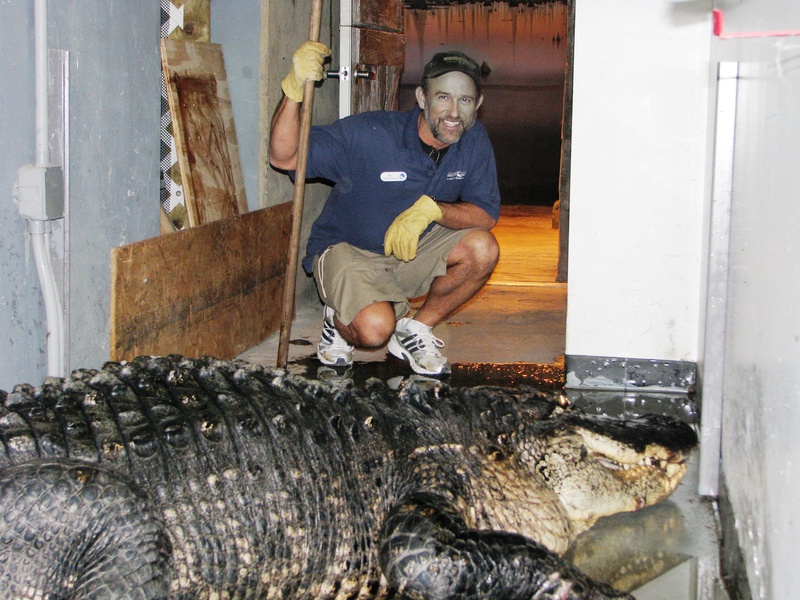 Ric Urban behind the scenes of the Gator Alley exhibit with Mighty Mike. Month and Year in which you began working at NAq? February 2004. What is your favorite animal at Newport Aquarium? African Penguins. What has been your most rewarding experience while working at NAq? Introducing “Paula the Penguin’ to a 95-year-old grandmother. She had tears in her eyes after touching the penguin, saying that was the most beautiful thing she had ever seen. As an Ambassador for Newport Aquarium, I have had many rewarding experiences connecting people with wildlife. What’s your favorite part of your job? Designing exhibits and bringing animals to the Newport Aquarium that “wow” the guests. How and when did you decide to get into the zookeeper field? 1981, when I joined the Sunset Zoo as a volunteer educator. After that I was hooked and the rest is history. This entry was posted in Zoo Keeper Week and tagged AAZK, animal husbandry, animals, Mighty Mike, penguins, ric urban, zookeeper week by NewportAquarium. Bookmark the permalink.